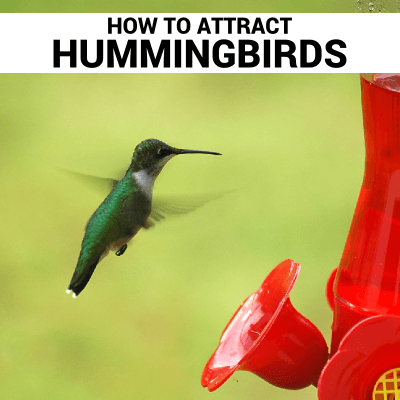 Anyone can attract hummingbirds to their yard by following a few simple steps! If you have a large yard you can plant vines along fences and trellises, add annual and perennial flowers to window boxes, hang baskets of blooms and pot flowers on your patio. If you only have a small garden or even just a patio, you can still put out specialty feeders to attract these wonderful birds to your space. While some hummingbirds prefer natural nectar sources, not everyone has room to plant a garden. Feeders filled with sweet nectar will also attract many hummingbirds. Nectar is available as both a premixed ready-to-use solution and as a powder that simply needs to be dissolved in water. Mix 1 part sugar to 4 parts water in a saucepan (example: mix 1 cup sugar to 4 cups water). Never use honey or artificial sweeteners as it can make the Hummingbirds sick! Boil the water and slowly add the sugar. Stir until the sugar is completely dissolved and the mixture is clear. Dyes are not necessary. You can attract Hummingbirds simply by using a colorful feeder. Remove mixture from heat and allow to cool completely before filling any feeders. Leftover mixture can be stored in the refrigerator for up to 1 week. To eliminate waste, make only as much as you’ll use in a week. Hang or mount your feeders in a spot where you can easy monitor and access it. An Ant Moat in use. Feeders should be cleaned at least once a week and refilled with fresh nectar. During the summer, when the feeders can be very busy, they may need to be cleaned more often. Just because a feeder can hold a large amount of nectar doesn’t mean you should fill it up all the way. Put out only what your birds will consume in a week. Hummingbird nectar can go bad if left in the hot sun for too long and the birds will not eat it. They may even stop coming to your feeder altogether if the problem persists. The sweet nectar will attract bugs; most notably ants. Use an ant moat to keep them out of your feeders. By choosing an option that holds a good amount of water you won’t have to refill it as often during the hottest parts of the summer. The most common style of feeder, inverted feeders put the nectar reservoir above the feeding ports and rely on gravity to keep the ports full. The lower part of the feeder has ports that the birds can dip their long bills into to access the nectar. The visible reservoir makes checking necat level easy and some feeders can hold quite a bit of liquid. Feeder materials, shapes, and designs can vary greatly. 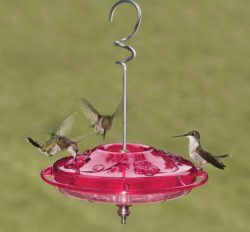 As long as the feeder is brightly colored Hummingbirds will be attracted to it so be sure to choose one that works well for you and suits your needs. 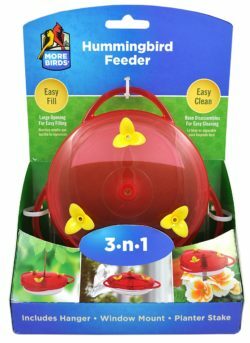 You may want to purchase a funnel for filling this type of feeder and a long bottle brush for cleaning. The lower saucer portion of the feeder may need to be disassembled in order to be cleaned properly. 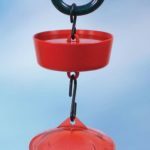 While not as common as inverted feeders, saucer feeders are another option when shopping for a Hummingbird feeder. While they do not usually hold as much nectar, they tend to be easier to clean and the clear bottoms make checking the nectar levels easy. Saucer feeders do not come in as many styles as inverted feeders but most saucer feeders come with their own built-in ant moat. Number of feeding ports – Some Hummingbirds can be quite territorial. It’s not uncommon for a single male to guard a small feeder with few ports; effectively not allowing other birds to feed there. The answer to this may be to put up multiple feeders around your space or to select a larger feeder with more ports. 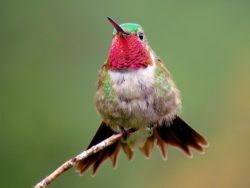 More feeding ports allow more than one bird feed at a time and can actually help reduce a Hummingbird’s territorial tendencies simply by making them share. Feeders with perches – While not necessary (flowers don’t naturally have them after all), perches may actually encourage the birds to stay at a feeder longer and offer you a great opportunity to photograph them. 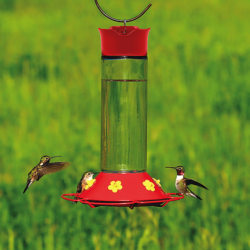 Mounting your feeder – Hanging may be the most common way to install a Hummingbird feeder, but many feeders can be pole mounted. There are options available that mount directly to your window using suction cups, and some that come with multiple mounting options. Hummingbirds love to bathe. 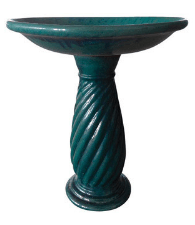 Adding a birdbath to your backyard is a surefire way to increase the number of birds visiting your yard. Plant flowers. Red, tube-like flowers are your best choice to attract Hummingbirds. Some good choices include: Bee Balm, Petunia, Beardtongue, Fuchsia, Butterfly Bush, American Columbine, Coral Bells, Delphinium, Hibiscus, Salvia, Cape or Trumpet Honeysuckle, Tiger Lilies, Morning Glory, Azaleas, and Eucalyptus. Shrubs, even when not in bloom, will provide an abundance of small insects that the hummingbirds consume for protein. Shrubs also provide perches, cover and possibly even nesting spots. They also act as dividers in your garden, creating multiple feeding areas, which is important when you have those territorial birds claiming plants and feeders as their own. 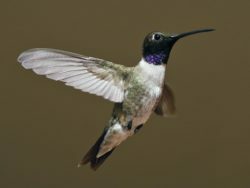 A small green-backed hummingbird of the West, with no brilliant colors on its throat except a thin strip of iridescent purple bordering the black chin, only visible when light hits it just right. Black-chinned Hummingbirds are exceptionally widespread, found from deserts to mountain forests. A jewel of high mountain meadows, male Broad-tailed Hummingbirds fill the summer air with loud, metallic trills as they fly. They breed at elevations up to 10,500 feet, where nighttime temperatures regularly plunge below freezing. To make it through a cold night, they slow their heart rate and drop their body temperature, entering a state of torpor. Broad-tailed Hummingbirds spend only a few short months in the United States. Stop along forest openings and meadows that are filled with flowers and listen for the loud metallic trill of their wings. Hummingbirds frequently return to one or two favorite perches, so a great way to get good looks is to follow one with your eyes (not binoculars) until it lands on its perch. Magenta rays burst from the throats of the male Calliope Hummingbird as it dances and hovers, performing U-shaped display dives for females. During these displays he makes a sputtering buzz with tail feathers and gives a sharp zinging call. This is the smallest bird in the United States, yet this tiny hummingbird breeds in meadows and open forests high in chilly Northwestern mountains, and travels more than 5,000 miles each year to pine-oak forests in Mexico and back again. One way to find a Calliope Hummingbird is to find its favorite perch on the breeding grounds. Most often their favorite perch is a bare branch sticking up out of a willow or alder. They habitually return to these perches, so look at the tops of these shrubs and you just might see a tiny bird perched atop. These brilliant, tiny, precision-flying creatures glitter like jewels in the full sun, then vanish with a zip toward the next nectar source. Feeders and flower gardens are great ways to attract these birds, and some people turn their yards into buzzing clouds of hummingbirds each summer. Enjoy them while they’re around; by early fall they’re bound for Central America, with many crossing the Gulf of Mexico in a single flight. 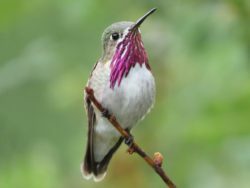 Find Ruby-throated Hummingbirds by wandering flowering gardens or woodland edges at the height of summer, or by putting up a hummingbird feeder or visiting a friend who keeps them. 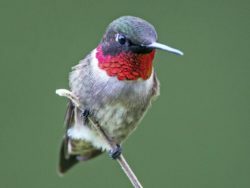 Ruby-throated Hummingbirds are common in suburbs and towns, and can become quite bold, feeding at hanging plants and feeders on your porch or next to your windows. One of the feistiest hummingbird in North America. 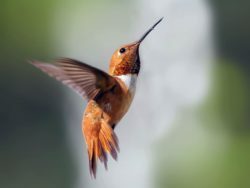 The brilliant orange male and the green-and-orange female Rufous Hummingbirds are wide-ranging, and breed farther north than any other hummingbird. Look for them in spring in California, summer in the Pacific Northwest and Alaska, and fall in the Rocky Mountains as they make their annual circuit of the West. Backyards and flower-filled parks are good places to find Rufous Hummingbirds while they’re around, but these birds spend much of the year on the move.